Tuesday is Earth Day. There's an "endangered" song, Earth Day freebies, and plenty of local events -- but how much do you know about D.C.'s environment? 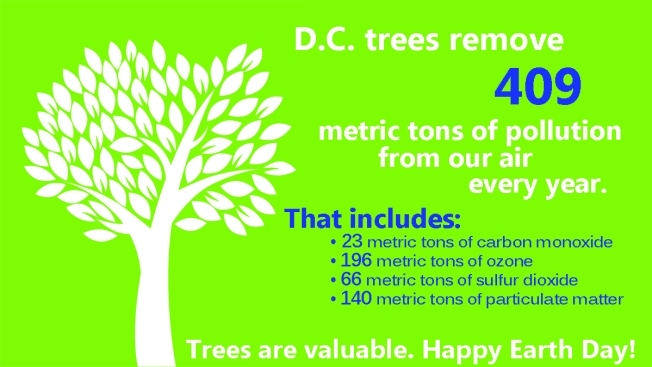 490: The number of metric tons of air pollution D.C. trees remove from the air every year. The air within the D.C. metro area doesn't meet federal air quality standards for ground level ozone and particulate matter, according to the D.C. Urban Tree Canopy Plan. Reducing emissions is the ultimate way to improve air quality, but trees are also an important part of the equation. 35%: The portion of D.C. covered by tree canopy. The city is trying to increase that to 40% by 2032. That will require a 25% jump in tree-planting rates -- every year for the next quarter-century. 10,800: The number of trees D.C. wants to see planted annually, with responsibilities shared among the District, the federal government and the private sector. 135,000: The number of gallons of water per second flowing down the Potomac River on Tuesday. When fertilizer goes down storm drains, it's carried through the river into the Chesapeake Bay, where the fertilizer creates favorable conditions for algae to grow. 37.9%: The percentage of D.C. residents who didn't own a car in 2012, according to Greater Greater Washington. 61%: The percentage of D.C. metro area commuters who drive to work alone, according to a report by the Metropolitan Washington Council on Governments. 4%: The percentage of D.C. metro area commuters who bike or walk to work. 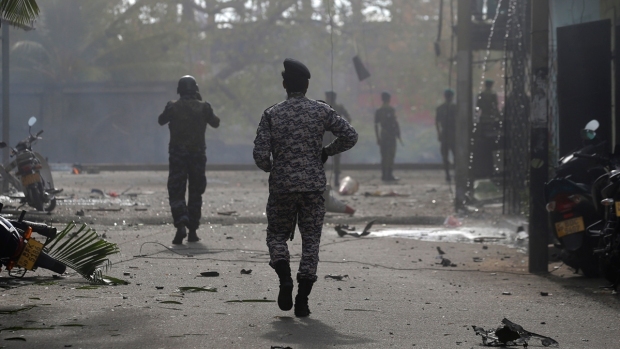 By 2040, that's expected to increase one percentage point. -15°: The lowest-ever recorded temperature in the area, on Feb. 11, 1899. 106°: The highest-ever recorded temperature in the area, Aug. 6, 1918 and July 20, 1930 (tie). 70°: The average high this time of year. 50°: The average low this time of year. 40": The average amount of rain D.C. gets a year. 32": Amount of snow that fell at Reagan National Airport during the winter of 2013-14 -- more than twice the average amount of snow, 15.5". -1°: The coldest morning this year, recorded at Dulles International Airport on March 4. 374: miles of bike trail in the great region (at minimum). The C&O towpath starts in D.C. and goes all the way to Pittsburgh. State birds: You may know (or not) that the state bird of Virginia is the cardinal, and the state bird of Maryland is the Baltimore Oriole (go figure), but how about the D.C. "state" bird? It's a wood thrush. State trees: How about state trees? In Virginia, it's a dogwood; Maryland has the white oak, and D.C. scarlet oak (nope, not the cherry tree). Not that kind of park: In 1870, Congress passed the Parking Act, which designated part of the area next to private property as a park area, to be landscaped and maintained by the owner of the adjacent property. That little strip of land may seem familiar -- its where the term "parking" our cars came from, according to the D.C. Urban Tree Canopy Plan. Storm Team 4 Meteorologist Chuck Bell contributed to this report.